This unique and comprehensive outcomes-based Code of Practice is the essential tool you need to plan, commission and provide good quality and effective Technology Enabled Care Services. The Code acts as a framework for procurement and provision of services, and can be used internationally. Digital health and care technologies are becoming more popular in the health, housing and care sectors, with sensors, smartphones, wearables, trackers and apps available to support health, care and wellbeing. Technologies such as telehealth, telecare, telemedicine, telecoaching and self-care apps, commonly called ‘technology enabled care services’ (TECS), can help with caring for the growing elderly population and people living with long-term conditions, as well as transforming the way people take part in and control their own health and wellbeing. The right planning and commissioning environment, supported by standards and tools, is essential to encourage the innovative use of technology to improve health and wellbeing outcomes, and for ensuring services are delivered in the most effective and efficient way. For the benefits of TECS to be fully realised, there needs to be firstly a considered and structured approach to planning and commissioning these services, which includes the identification of the need together with a strategy to best meet the need. To date, other Codes of Practice for TECS have only focussed on the provision of services and supplier end of the market, which, although important, does not address the whole-system. Uniquely, this Code, which sets out standards covering every aspect of services, offers an end-to-end and whole-system approach, ranging from the early planning stages through to post-implementation of services. 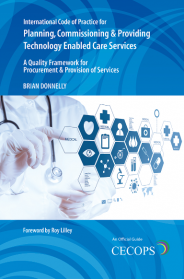 It can be looked at as a value-chain solution that interlinks those responsible for planning and commissioning services with service users, through the activities of clinicians and providers. Following the Code enables the longstanding barriers to adopting TECS more widely to be overcome, ensuring projects and initiatives are delivered with the best possible outcomes, with the ability to measure their success and embed sustainability.